It's April, which typically means rain. Thankfully, it's been sunny and warm-ish so far, but I know that won't last. 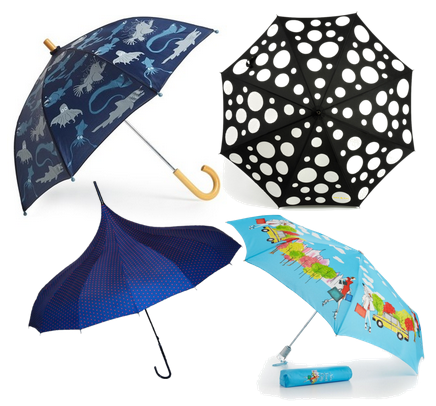 Brighten up rainy days with a playful umbrella. Which is your favorite? 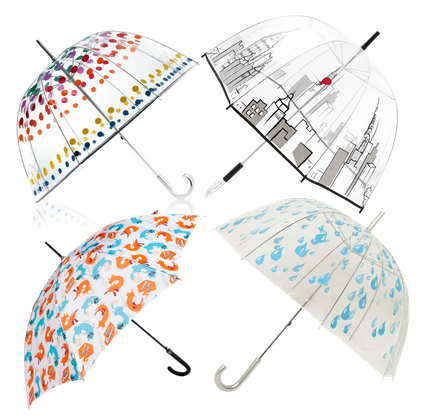 For practical purposes, I love the clear umbrellas! I have the same problem with my umbrella (hence the shopping for a new one). Have you tried the clear bubble umbrellas? My mom has one, and it won't turn inside out because of it's shape. No, I haven't! I should, though, that sounds fantastic. I was hoping that somewhere out there was some type of super-umbrella that wouldn't succumb to the wind.